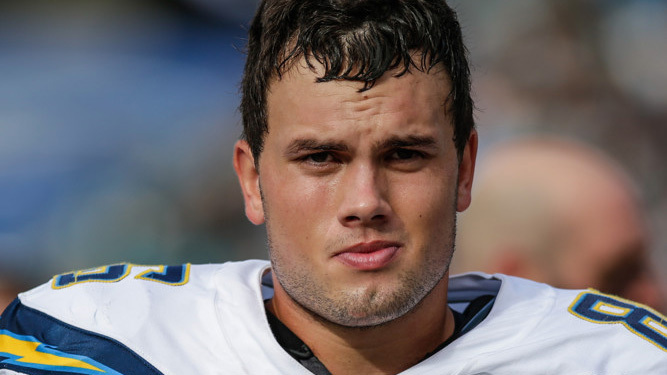 The Los Angeles Chargers‘ offense was dealt a blow Wednesday after its star tight end Hunter Henry is out for the season after tearing the ACL in his right knee on the first day of OTAs on Tuesday. Henry, who is entering his third season in the NFL, was expected to be the focal point of the Chargers offense as the team parted ways with Hall of Famer Antonio Gates last month. With Henry out, the Chargers could be looking at bringing Gates back, according to ESPN. Gates, a fan favorite, has a good rapport with quarterback Philip Rivers. Losing Henry will be tough for the Chargers. He has essentially taken over as the Charges’ primary tight end last season, where he started in 13 of 14 games with 45 catches for 579 receiving yards and four touchdowns. Henry was hurt early in practice during team drills. He was able to limp off the field on his own and remained there for there rest fo the session after he was looked at by team trainers. When asked whether the team is looking at Gates or another tight end to take over for Henry, Telesco said it’s early in the year and they are looking at options. The Bolts have several tight ends on the roster: veteran Virgil Green, who signed as a free agent from Denver in March, Sean Culkin and Braedon Bowman, both second-year players, and Cole Hunt and Ben Johnson, two undrafted free agents.